This is the Real Deal! Step back in time and experience the thrill and exhilaration of high "g" aerobatics and combat manoeuvring in this genuine 1942 fighter pilot training aeroplane. This is the Real Deal! A genuine WW2 Warbird! Step back in time and experience the thrill and exhilaration of high "g" aerobatics and combat maneuvering in this genuine 1942 fighter pilot training aeroplane. The actual aeroplane you will be flying in was used by the United Stated Army Air Force during WW2 to train fighter pilots for frontline combat. Meticulously restored to pristine condition, our beautiful T6 Texan is just as she was when she rolled out of the factory in 1942. Before each flight you will receive a thorough briefing on the maneuvers you will be performing and on all aspects of the flight. Immediately after take off you will feel the exhilaration from the power of the classic Pratt & Whitney 600hp radial engine as it pulls you through the sky performing aerobatics such as the Loop the Loop and the famous Victory Roll that is synonymous with fighter pilots of the Second World War. 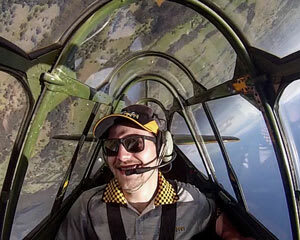 Nowhere else in Sydney can you experience flight in this classic fighter trainer. Book Now for an unforgettable experience of your lifetime. Southern Warbirds were simply brilliant, the plane was spectacular, the experience phenomenal and Dave and Norm were fantastic. Thank you!